A naked hula hoop is not much to look at. This lady used to be neon-rainbow-striped with a spiral of glitter in between. The look served her well for many years, but like all favorite outfits, it eventually sprouted loose threads and wore thin on the elbows. It was finally time for new tape! Yay! I had been waiting for this moment ever since my sis-in-law Em got me this awesome fantastic box of hula hoop tape. This hula hoop has been with me since I took a Hoopnotica class circa 2005 (! ), and the tape lasted forever! I was 15 years old the first time I went to hear Ray Bradbury speak. I rode with a friend and her mom out to a cramped little library in the middle of the desert, to a tiny town called Lucerne Valley. It was so old-school you could still see where they used to park the covered wagons. We had to park way out among the Joshua trees and walk like concertgoers through rows of cars up to the brightly-lit library. We wormed our way through excited book nerds and squeezed in, ducking beneath a latticework of elbows until we reached an open spot on the floor near the front, where we sat cross-legged like good little children. I couldn’t believe it. There he was! In the flesh! Mr. Ray Bradbury, Celebrated Storyteller and National Treasure—the guy who wrote Fahrenheit 451!—with his gleaming white hair, thick black glasses, and the biggest smile I’ve ever seen on a human. So the kid and I recently went to our first ever Movies in the Park in Redlands, California, to watch The Lego Movie. Secondly, against all astronomical odds — especially during a popular event like this — I found parking within smelling distance of a healthy fart. That’s how close we were. AWESOME! Our friends had already staked out a primo spot, so it was just a matter of transferring our chairs from our primo parking spot to our primo reserved spaces. AWESOME!! The mood was festive! Kids were all over the place. Bags of Legos were passed out to eager little ones, and people in lawn chairs were scattered all over the place. We all brought snacks. There was no doubt we were headed into an awesome evening. When I first embarked on this publishing adventure, my plans were simple: get my stories out on e-readers…period. I wasn’t thinking I’d publish in paperback, and it certainly didn’t occur to me to do illustrations. I hadn’t drawn much since high school, and I hadn’t made any finished pieces…like ever. My practice had pretty much been limited to doodling. And while I am a prolific doodler, it was a big question mark whether or not I could translate my doodling skills into usable art. But once this idea of illustrating Between Friends wormed its way into my little brain meats, I couldn’t get rid of it. I loved the illustrations in all of my Nancy Drew books. 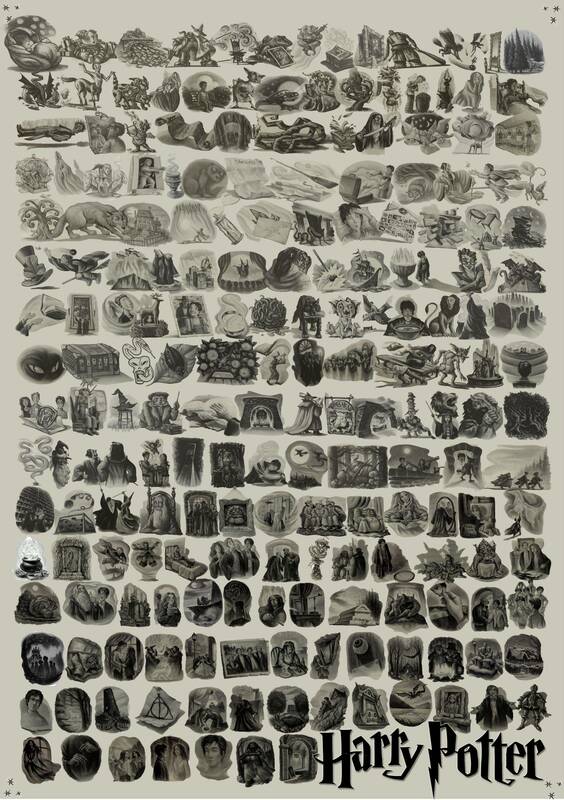 I LOVED the illustrations that marked the beginning of each chapter in the Harry Potter series. More recently, I was introduced by my best friend Kellie to the delightful mystery writer Alexander McCall Smith. He’s probably most well known for his No. 1 Ladies’ Detective Agency series, but he also wrote the charming 44 Scotland Street series, as well as the outrageously understated and quirky The Professor Dr. von Igelfeld Entertainment series . These last two series, 44 Scotland Street and Professor Dr. von Igelfeld, were both illustrated by Iain McIntosh, an artist who is so perfectly paired with these stories that he lives only two minutes’ walk from 44 Scotland Street in Edinburgh. His work features heavy lines that contrasts nicely with some of the absurdities of the stories, and they are deceptively simple. But I could do it, I thought. They’re such little pictures. Little pictures are doable. I’ll just keep it simple. I’ll start with a fish. Fish are easy, right? Fat Cat gave me that inscrutable look he always gives me. It couldn’t be that hard, right? Fish are easy. A long football shape with eyes and fins and scales. Got it! Not really. I mean, it wasn’t hard to draw a fish…but I really didn’t know how to go about it. What kind of pens do illustrators use? And what about style? Where does one find some of that? I think the most important thing I did, though, was just to start. I started with a doodle. Then I realized I didn’t know all the proper parts of a fish, so I printed up different reference images from the Interwebz. For a hot minute, I thought I’d go with a more stylized approach in an effort to keep it simple, and because I so admire the unique look of Iain McIntosh’s illustrations. Ultimately, though, I ended up redoing my “simple” fish to match better the illustrations that followed. I mean, this may just be a fish, but in the story, it’s a damn happy fish. At least at that moment in the story. The next moment, not so much. By the way, my “equipment” was pretty basic. I used watercolor paper since that’s what I had, and I sketched everything in pencil…just cheap, plastic click-click pencils. I used Pigma Micron pens by Sakura of various tip sizes, discovering a preference for the 03, or 0.35 mm line. I traced over the lines I wanted to keep with archival ink, then went over the whole thing with an eraser to get rid of the pencil lines. That’s it. Nothing fancy. The next illustration in the book came from the need to break up a long bit of text. It seemed natural to have an illustration at the beginning of one scene, which was marked by a microwave clock. I really didn’t want to draw a picture of a digital microwave clock (boring! 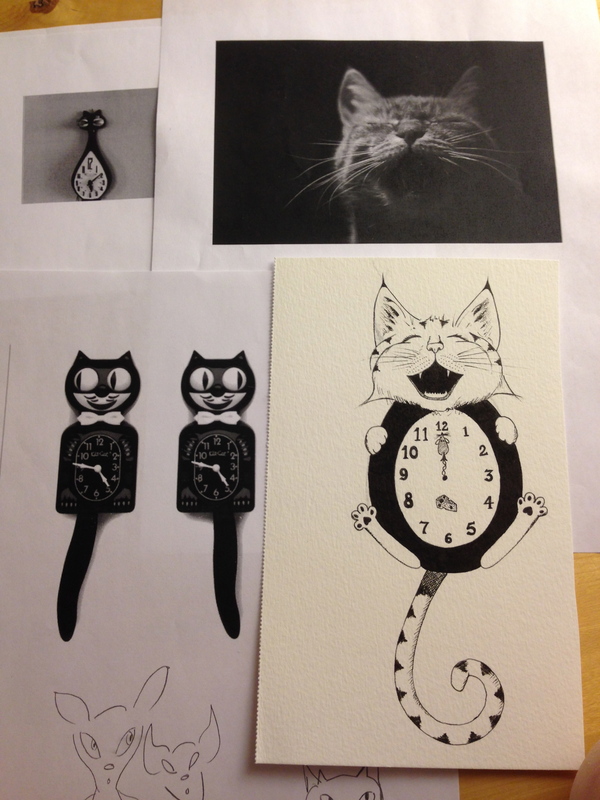 ), so I decided it should be a swinging-tail cat clock because that’s totally what my characters Erika and Chimmy would put in their kitchen. By this time, I had discovered a love for crosshatching. It is a special kind of meditation that quiets my ever-screeching monkey mind and makes me particularly happy. (For a taste of crosshatching happiness, check out Dan Nelson’s incredibly mesmerizing video Pen and Ink Cross Hatching Masters Edition.) Also, I am a huge fan of Maurice Sendak’s work, especially in Little Bear. Aww! For Between Friends, I wanted to include a couple of full-page illustrations, so again, I tried to keep it simple. This is also when I discovered the value of doing studies. I had heard of the technique, but it wasn’t until I had drawn one — a teeny, tiny doodle really — that I realized what it was and why artists do it. It’s basically a thumbnail of your concept, just enough to give you an idea of whether you’re heading in the right direction or not. Lightbulbs blazed to life above my head at this discovery. For the frontispiece, the illustration that faces the title page — both Nancy Drew and the Hardy Boys series featured fantastic frontispieces — BRING BACK THE FRONTISPIECE! — I got a little ambitious. Simple went out the window and sleep be damned, seven hours later I had my frontispiece. Crosshatching bliss! You can’t get this kind of peace from hot mama yoga. I’ve tried! As you can see, my first attempt at the concept produced a rather poopy-looking cloud, as Fat Cat astutely pointed out. So I delved into the depths of the Interwebz for various reference photos for the clouds and terrain, made a little study to figure out my contrast, and eventually came up with the storm that Chimmy rode into town on. After finishing the storm piece, I started to feel confident that I might actually be able to pull this off. I mean, this was crazy! For the first time ever, I had completed illustrations…with an end purpose in mind. Art with purpose! How was this possible? I didn’t want to scare it away. ….as well as the reflection of Erika’s eyes when she reached for the knife at Chimmy’s desperate pleading…. 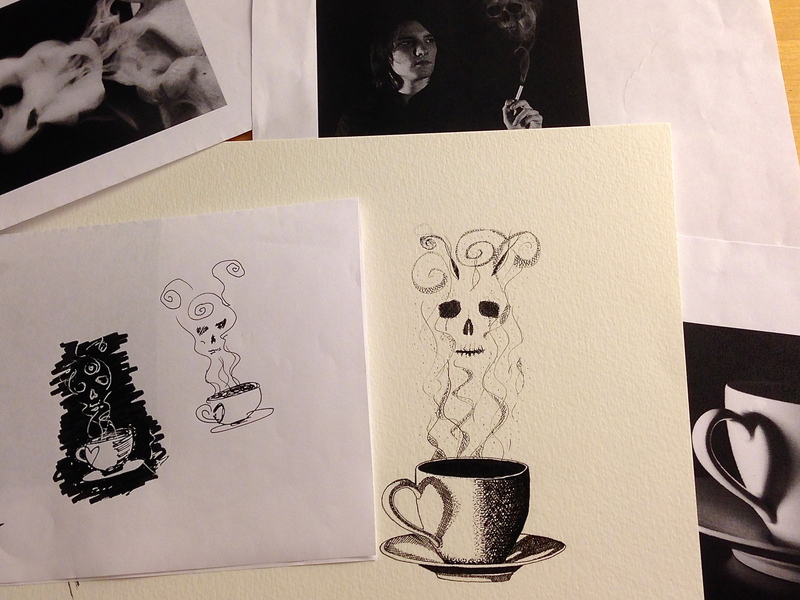 …and finally the end piece, a last cup of tea. So if you are an author interested in illustrating your own work, but don’t feel you have the experience or know-how — or are just interested in art-making in general — keep this in mind: this did not take me very much time. From start to finish, I probably did these over a two-week* period of time, the longest piece taking 7 hours, the shortest…maybe an hour, hour and a half. This is with no significant prior experience. A little bit of doing goes a long way. To me, this is an example of a project that seemed bigger and more difficult than it actually was…yet, was only able to be achieved due to one single thing I did: I started. If you’re interested in seeing the final product and reading a pretty twisted tale of friendship and dark secrets, you can find it here. Includes interior illustrations by yours truly, an essay on Ray Bradbury, and a picture of me paying homage to the Far Side lady! Available on Amazon in paperback and Kindle. Other e-tailers coming soon! The Fry Fest on Fryday <teehee> was such a success, my friends returned to the scene of the crime the following day to finish what we started! The above portrait features Jeff’s chili nuclear-blasted atop a pile of steamed rice, encased in a protective layer of melted cheese, blanketed with a thick layer of homemade guacamole, and sprinkled with chopped red onion. This is the leftovers of superheroes! Fried plantains with Cuban rice and Spam…a few pieces of steak…and a pickled onion! Winner food! Finally, there was a small amount of my mom’s shrimp wonton mix that didn’t find its way into wonton wrappers. That was scooped up by muah, stir-fried with eggs, rice, and soy sauce, and was received by a cheering five-year-old who gave me a standing ovation. It was decided amongst friends and family that there should be a great coming together to deep-fry lots of things in boiling oil to celebrate our nation’s independence. And so that’s what we did. The above featured photo is of Danny’s tempura-battered smoked-salmon-and-cream-cheese-stuffed peppers…the man lives for his art and is the one who first conceived of said excellent idea. The peppers were smack-taculous! Crunchy on the outside, tender and smoky on the inside….E-GAD! Danny’s beautiful wife Tatiana, whose passion for food rivals, if not surpasses his (I’m so going to get a text from him on this one! ), made these delicious ham croquettes. So soft and savory on the inside, a perfect crunch on the outside! The next items to emerge from the Fry Daddy were from my mom. I am ashamed to say I have no pictures of them. I just wasn’t fast enough before her crunchy-bottomed dumplings, crackling hot wontons, and mini-in-size-not-flavor egg rolls disappeared into the aether. It’s like they never existed. A dream you can’t quite remember…but can still taste a little. *sniff* I had to tackle a five-year-old to get the last one. Straight out of National Geographic. It was an ugly scene. I had a package of lavash I didn’t know what to do with, so I put together these impromptu turkey cherry roll-ups. Super easy! Chopped up about a cup of fresh cherries (hand-pitted, yes…only the best for my best), mixed it in with a package of cream cheese, which I then smeared onto the bread, layered sliced deli turkey, baby spinach, and a little red onion. Rolled that up like a…struggling for a metaphor here ;)…sliced them up, and voila! Easy and yummy! My first attempt at yeast donuts — directed by Alton Brown, fried by my mom! I had never made yeast donuts before, so I turned to my favorite food source: the Irrepressible Mr. Alton Brown. He has never steered me wrong in a recipe, and for that reason, he is my hero. (Plus, his videos delight me to no end.) It was easy, came out fluffy and light, and made a frightening pile of donuts that disappeared before the night’s end despite the cries for mercy as more food kept marching down the picnic table. Dessert! Look at dem coals! Fresh grilled corn was the cherry on the top. Sweet and smoky. No comparison! Honestly, these pictures only scratch the surface. I’m an unreliable historian when it comes to these events because I’m busy cooking, laughing, poking fun…and eating. Yes, that’s right. I was too busy eating to keep up with pictures. I’m sorry! I’m weak! Weak! …your friends will strip you of your dignity and post it on social media for all to enjoy! So party rock responsibly! Hope your 4th of July is EPIC! When do we shave him? How do we make it look good? Too many times I’ve been too proactive and had him shaved before June Gloom. As soon as the hair came off, the temps would fall, and he would end up huddled in a blanket in the corner. Bad Mommy. So this year I waited until it was good and hot. And it’s been good and hot! Typical 100-degree California summer. He was panting constantly, even in the house under the air-conditioning vent. His thick fur wrapped all the way around his belly, he kept tripping on his own toe hair (swear to Murphy! ), and his ear hair was Muppeting again. “You’re getting a haircut, young man!” I told him. Dang. Note to Self: Maybe next time don’t ask for them to round off his head. By the by, did you know my new book Between Friends is out? I think you’ll like it. It’s about an elderly hoarder and her relationship with an otherworldly fellow who suffers a deep, dark secret…and the awful promise she is forced to make to him. It includes interior illustrations by yours truly, an essay on Ray Bradbury, and a picture of me paying homage to the Far Side lady!